Finding your way around New York can be difficult, at first, but once you understand the ‘grid system’ it’s a lot easier. Manhattan is, in fact, famous for it’s grid system. In theory, it is very simple. All the streets run from east to west and all the avenues run from north to south. Manhattan is divided into three main sections: Downtown, Midtown and Uptown. 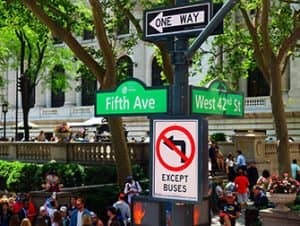 Downtown starts south of Union Square, Midtown is north of Union Square up to 59th Street and Uptown is everything north of the bottom of Central Park. Broadway is an exception as the street cuts through the whole of Manhattan. South of Houston Street (in Greenwich Village) the streets have names instead of numbers. Some of the avenues in the east side of Manhattan also have names, in addition to numbers, such as Madison Avenue. In the Uptown area, the west side of Manhattan avenues are also named rather than numbered, such as Columbus Avenue. In Harlem, both street names according to grid plan and an honorary name are used. 125th Street is also known as Dr Martin Luther King Boulevard. Addresses in Brooklyn and Queens run differently. Fifth Avenue splits Manhattan into the east and west side. Numbers grow from Fifth Avenue both towards east and west. On the east side addresses say east or E and on the Westside addresses read west or W. Therefore 17 East 35th Street is a completely different location than 17 West 35th Street. To make life easier, usually the closest cross street or street corner is used in the address. For example 45 Essex Street (between Grand Street and Hester Street). Always tell the taxi driver your address using the cross street or street corner, for example “42nd Street and 9th Avenue”. Eric’s Tip: Download my free app, Eric’s New York, so you can easily find your way around New York. In the app you can find a map of the city which includes subway lines, attractions, public toilets and free wifi hotspots. The app can be used offline and has built-in GPS, so you can always see where you are.